Alma Scharfe, who’s visiting the Methow from Germany, just learned to sew, but she’s already finished an apron, nightgown and jewelry bag to show at the fair. “Let’s Stirrup Some Fun!” That’s the theme of the 71st-annual Okanogan County Fair, and dozens of kids are grooming their pigs, sheep and steers in last-minute preparations for the event. Others have been baking and canning, setting aside prize tomatoes and pumpkins, and sewing and working on art projects for the food and crafts divisions. 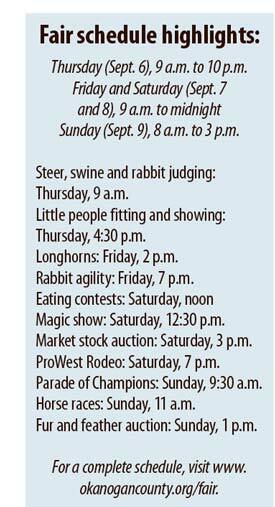 The fair runs from Thursday through Sunday (Sept. 6 to 9). 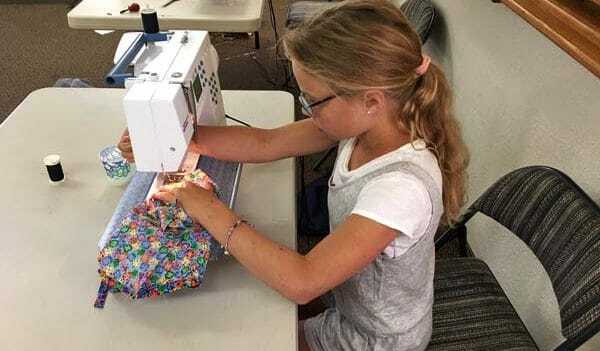 Alma and Greta Scharfe, ages 11 and 9, learned to sew just a few weeks ago, but they immediately took to it — they’ve already made aprons, nightgowns and jewelry bags to exhibit at the fair. The girls have also been baking up a storm — everything from muffins to zucchini bread to baguettes, said their mother, Nadja Scharfe. 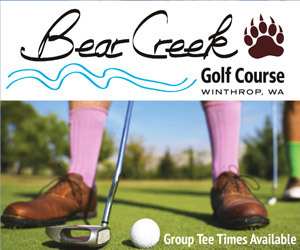 This will be the first fair for the Scharfe family, who are visiting the Methow from their home in Biberach, Germany, a small city west of Munich. “My kids don’t have a clue about it. I think it’s going to be exciting,” said their mother, Nadja, who was first introduced to the valley as an exchange student 26 years ago, when she lived with Chris and Robin Eliasson in Twisp. On subsequent visits, Nadja also got to know the Eliassons’ neighbors, Bill and Suellen White, long-time organizers and supporters of the Methow Valley Cascaders 4-H Club. Even Nadja’s 5-year-old, Carl, is putting together food exhibits for the fair, but his main passion has been chasing chickens and pigs all day, she said. Pigs are by far the most-popular animal for Methow kids this year, with about 24 Cascaders raising them. About five kids have raised steers, and this is the first year in a long time that local kids have raised sheep, said Suellen White, the 4-H club leader. Some younger children will be exhibiting rabbits. Dusty Patterson and his two brothers are raising pigs for the third year and looking forward to the livestock auction on Saturday. The boys started with their month-old piglets in the spring, weighing them constantly to determine the right amount of food, said Patterson. Pigs, which tend to gain about 2 pounds a day, must weigh between 235 and 290 pounds to qualify for the fair, but Patterson said judges prefer slimmer pigs — around 265 pounds — with good muscle tone. For the first time, kids in 4-H can get school credit, thanks to a senior project by long-time 4-H exhibitor Emily Paul. The students receive credit for their fair book, which documents the daily progress and care of their animals, and for their public presentations and educational exhibits. Liberty Bell High School student Shelby White, the first fair queen from the Methow Valley, has been busy all year promoting the fair at parades, rodeos and schools. Shelby, who is Bill and Suellen White’s granddaughter, will complete her reign this weekend.